Does your family plan special evenings dedicated to family fun? If so, then you’ll enjoy these fun family movie night ideas with free printables! 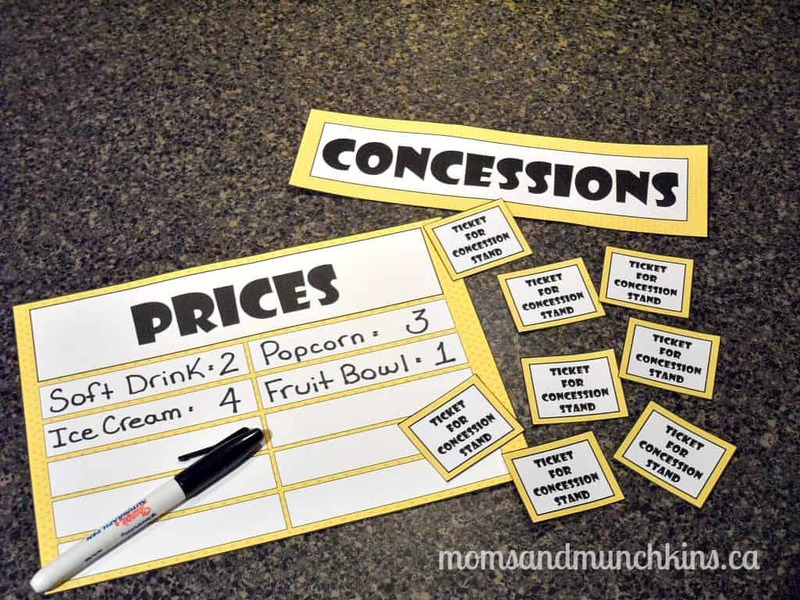 The free printables include a “Concessions” sign, a “Prices” sign and concession stand tickets. Click here for the free printables. At the beginning of the week, you could let your kids know that there will be a family movie night happening this week. They will have the opportunity to win tickets for the concession stand. How do they win the tickets? That’s up to you! Some ideas are to earn tickets by doing something kind for someone else, tickets for an accomplishment (in school, in sports, etc. ), etc. These food items can be written on the “prices” sign and you can assign a ticket value to each item. To encourage the healthier items like fruit and water, those could be a lower ticket value than the popcorn, soft drink and candy. On the day of your family movie night, your kids can help set up a movie theatre in your living room. This could include large comfortable pillows and blankets, a fort area to lay in to watch movies, stocking the concession area with napkins and straws, hanging the concessions & pricing signs and setting out a selection of movies to choose from. What is your favorite family-friendly movie? Never miss an update on family fun ideas by following along on Facebook, Twitter, Pinterest and Bloglovin’. too funny – I JUST made a post about family movie night! http://www.talesofmommyhood.com/2012/10/family-movie-night.html – I think I am going to edit and link to this too – do you mind? Wow! What a neat idea! Thanks for sharing. Ummm…I’ve had to create a new folder for just YOUR stuff! lol Love your blog! What a cool idea! We have our movie nights but I’ve never thought about tickets!! Wow, how creative, you always have such great stuff for family activities, tis one looks like a lot of fun, thank you for sharing! Neat idea!!! You’re super creative!